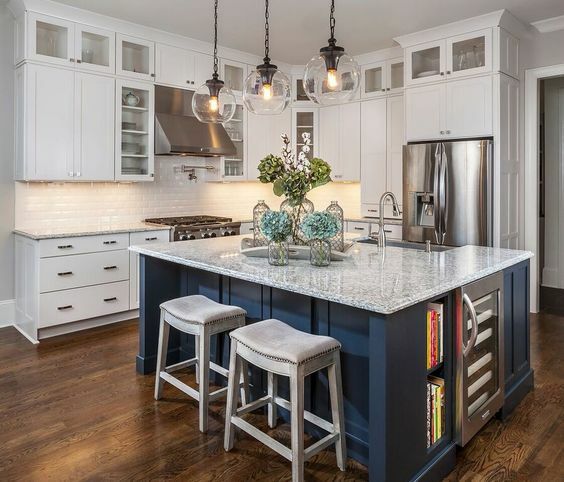 When it comes to remodeling your home, it doesn’t get any better than updating the kitchen, but that doesn’t mean you should go hog-wild and update everything in sight. There are a number of factors to consider including the location of your home, its value, its style, current government incentives, and more. Whether your kitchen is horribly outdated and the whole thing needs to be remodeled or you’re just looking for a few things you can do here and there to make your kitchen look fresh, these 10 design details will skyrocket the value of your home and provide you with the largest return on your investment. Appliances are a staple in the kitchen, and they’re one of the first things that home buyers look for. Stainless steel looks good, it’s easy to clean, and updated stainless steel appliances can decrease energy consumption, which are all things that will increase the overall value of your home. Although it may seem boring, it’s actually best to stick with a neutral color palette in the kitchen. White is an easy choice, but if that’s a little too boring for you, choose creams, greys, and tans. If you want to add a little color, do it somewhere that can easily be painted, like the bottom of an island. Backsplashes are more popular than ever. Not only do they look good, they’re easy to clean. However, the rules of the neutral color palette apply here as well. Although those colorful Mexican-style tiles are beautiful, they won’t appeal to everybody, and they’re likely to look dated in the future. There’s just something about a granite countertop. It’s the epitome of luxury in the kitchen, but there are a few other choices if granite isn’t really your thing. Quartz and marble can be good choices too! Just make sure the countertop you pick fits in with the overall look and feel of your kitchen. Updating the countertops is silly if you have linoleum flooring or old wooden cabinets. A lot of space goes to waste in traditional cabinets. A kitchen trend that doesn’t appear to be going anywhere anytime soon is sliding cabinet drawers. They are especially effective in corner and lower drawers. They provide you with easy access to kitchen equipment, dishes, pantry items, and more. Keeping with the natural theme in the kitchen, we’ve added natural stone floors to the list. Carpet is an obvious no-no in the kitchen, but linoleum and vinyl have a way of looking dingy and dated too. If you really want to add some value to your home, choose a natural stone floor in the kitchen. Cabinet styles come and cabinet styles go. Lighter wooden cabinets may be in one day, only to be replaced by dark cherry the next. If you want your cabinets to look timeless, choose Shaker-style cabinets. A coat of paint is all it takes for them to look fresh again. There are many ways to light a kitchen, but track lighting is one of the most popular. Track lighting can be fairly basic and affordable, or you can spruce up those boring track lights with fun covers to give your kitchen a modern look. Technology has come a long way, and it’s infiltrating every area of our lives. Adding technology to the kitchen is a fun way to add some value to your home. Add a charging station in a drawer, a Bluetooth speaker system with an iPod loading dock, or lights that can be controlled by a smartphone. Sinks are another item in the kitchen that can be a little too trendy. Update that sink, but keep it simple. Choose a large stainless steel sink and you can’t go wrong. It’s even better if you can add a stylish faucet with a convenient sprayer. Ready to update that old, tired-looking kitchen? Give us a call! We can do as little or as much as it takes to skyrocket the value of your home.